Every few months I do a review on a popular book. This one I read on a recommendation, but I can’t recommend it. Dr. Joe Dispenza has some great quotes, like: “A memory without the emotional charge is called wisdom.” And, “Change as a choice, instead of a reaction.” I’m sure these quotes, and his desire to help people become better people, has helped folks. But I still can’t recommend this book. Others have taken the author to task for his “science.” Since I’m no scientist (nor is the author), I’d like to focus instead on the theology being taught, and contrast it with Christianity. Dr. Joe teaches a doctrine of looking within, of focusing on our inner selves to find divine happiness. This is just a short list to demonstrate the contrast of Dr. Joe’s New Age religion to Christianity. Much of this book reminds me of Star Wars. George Lucas has been open about borrowing his “Force” ideas from Buddhism and Taoism, as a way of bringing spiritualism into his movies. Dr. Joe Dispenza has not been so open. However, an overview of the schools he has been connected with helps explain where he is coming from. I believe all the information below came from Dr. Joe’s site, Amazon’s book site, the school’s sites or Wikipedia, but there could be sites I don’t remember. I tried to go to original sources, not those upset with Dr. Joe or his teaching. His bachelor’s degree (I never could find what it was in) is from Evergreen State College, his Dr. of Chiropractic is from Life University. But his other connections help to understand the New Age leanings in the book. He is a faculty member at Quantum University in Honolulu, Hawaii. This school’s accreditation is by an organization in India. I know nothing about it, but would guess they don’t serve hamburgers for lunch. The Omega Institute for Holistic Studies in Rhinebeck, New York. This is a non-accredited New Age retreat center. It started from the teachings Eastern meditation teacher, Pir Vilayat Inayat Khan. The Kripalu Center for Yoga and Health in Stockbridge, Massachusetts. According to the interweb, Amrit Desai, who was a disciple of Indian yoga master Swami Kripalu, started the school. It focuses on Yoga and other eastern religious thought. Ramtha’s School of Enlightenment(RSE) is located in Washington state. This school is the most interesting. J. Z. Knight, who claims to channel a 35,000-year-old warrior named Ramtha the Enlightened One, established the school in 1988. I read that, “the school bases its teachings on these channeling sessions.” If so, it would be a helpful place to go if one needed schooling in the art of war in 33,000bc. Joe taught at Ramtha, but doesn’t often mention this school. On the back of this book he highlights the film he was in called “What the Bleep Do We Know! ?” which was produced to promote Knight’s teaching. In googling the movie, I read that it got a Pigasus Award for “the media outlet that reported as factual the most outrageous supernatural, paranormal or occult claims.” I have not seen the movie. Their four cornerstones of this school are: 1) The Statement, “You are god.” (I wonder what the real God thinks about that) 2) The mandate to make known the unknown, 3) The concept that consciousness and energy creates the nature of reality, 4) The challenge to conquer yourself. Is Dr. Joe a god? His book forward and website claim postgraduate training in neurology, neuroscience, brain function and chemistry, cellular biology, memory formation, brain imaging, neuroplasticity, epigenetics, psychoneuroimmunology, aging and longevity. I could find no school names or evidence of these claims, but if they are true, and he understands it all, maybe his is a god. I read this book on a recommendation, but I can’t recommend it. This update just in from our Missionaries in Port-au-Prince. This is Gaelle. (photo from English Camp 2018) She is one of five children, soon to be six. 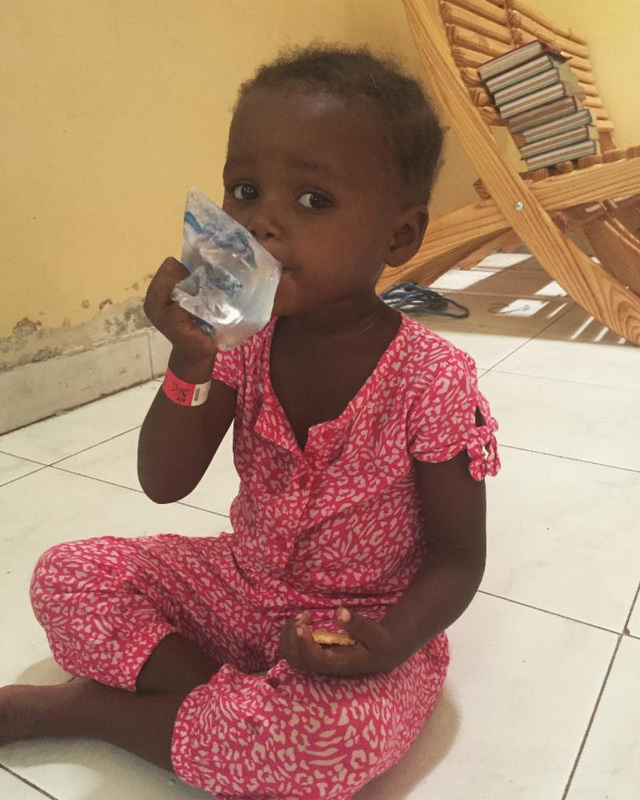 Gaelle has now missed 7 days of school: meals, vitamins, snacks, Bible stories & play time. We are thankful that God has made a way for us to walk alongside Gaelle’s family during this time. February 2019, has been a month for the books! We stepped into February with big plans for Byron and Shelley’s 30th anniversary celebration, incoming teams, and hopefully the rescue of children from a corrupt orphanage ,,,,WELL, we did pull off the anniversary celebration! We returned to Haiti from Santo Domingo on day 4 of ongoing demonstrations, road blocks, burning tires and the shutdown of grocery stores, gas stations, water stations, and street vendors. The manifestations have not been limited to Port-au-Prince, but have extended to other cities and the countryside. This is a political issue, and the folks behind the demonstrations are seeking President Jovenel Moise’s resignation. There is hurt and anger stemming from years of corruption and mismanagement of resources , rising fuel and food prices, and general frustration with the lack of employment and educational opportunities. After 9 days of lock-down, we have been granted a “pause” of 2 days. They have kindly given the population time to locate food, water, and fuel. By the grace of God, fuel began being delivered to the gas stations in our area yesterday. Public transportation shut down the afternoon of February 6th, and began operating again today, February 17th. God has faithfully and graciously cared for our needs, and permitted us to be an extension of His grace and provision to others. We have a wonderful staff who have helped us locate and purchase supplies, and we can say with MUCH THANKFULNESS that we are well supplied with food, water, and fuel. It is our deepest desire to walk this out well. To this point, God has not given us the “green light” to evacuate. We do receive the security alerts from the US Embassy, and are very cautious if/when we venture out. For now, we are stewarding the resources which God has given us for the care of those He has placed within our sphere of influence. Will you please pray with us, and for us? To keep our eyes fixed on Jesus, and to spend the down time we’ve been given to rest in His presence. To have discernment: what to share, in what quantities, and with whom? For insight regarding what to purchase and where. For wisdom regarding the upcoming scheduled mission teams and visitors. For our continued safety: Byron, Shelley, Joe, Ben, Dom, and Isabelle Tlucek are still in Haiti with Sue Spinney. WE PRAISE GOD FOR HIS FAITHFUL CARE AND PROVISION, FOR HIS PERFECT TIMING, AND HIS LOVE, MERCY AND GRACE. TRULY, WE ARE GRATEFUL TO BE CALLED THE CHILDREN OF GOD. Download a free e-copy of The Pilgrim’s Progress book here. The artwork is AMAZING, totally fun. It’s from the movie that is coming out in April. That’s not a bad run for a book. Typically, if you are part of the fortunate 2% or less, (depending on who is number-crunching) who get their books traditionally published, you may get a 3-month run. So, a 4,092-month run and a movie deal isn’t bad. It’s no Bizarre Bible Stories, but not bad. We hope to show an early pre-release showing of the movie at AnchorPoint in March, to get folks excited about blowing big bucks and bringing their friends in April. We also hope it is good. Otherwise, it won’t help much. The picture is from Bizarre Christmas Bible Stories, unfortunately not being released till 2019. It’s our take on a Magi, and has nothing to do with 2 thoughts from 2 very different writers. This day we celebrate the Lord of creation taking on flesh without division, separation, confusion, or change. This day we celebrate the Logos, who willingly and vulnerably enters into the creation that He Himself spoke into being. This day we celebrate the very purpose and end of the whole cosmos, intimacy with God our father. We worship a good and powerful God. “Glory to God in the highest, and on earth peace, good will toward men.” This is a Merry Christmas indeed. American Thanksgiving is on the wrong date. The Canadians have it right, and celebrate Thanksgiving on the second Monday of OCTOBER, as the Pilgrims intended. President Lincoln got many things right, but was allowed by God to make this one glaring error to prove to the world that even he wasn’t omniscient. Now you know the truth. The stores have it right. Besides, there just isn’t enough time to enjoy the season if all your shopping, decorating, family meals, traveling, college exams, parties, and Christmas movie watching have to be done in a few weeks. That’s no fun. Start today and enjoy a slow, mellow, long, shockingly long Christmas season, as Costco intended. music, Frosty the Snowman could gag a Shepherd. Still, after 10 months of Country divorces, Rap killings, Pop romance and Hillsongs oceans, aren’t you ready for a change? If you wait to shop till December, when you are also paying for travel and party gifts and eating out, you will still be paying it off in July. Buying now will help keep you out of debt, allowing you to retire years early. Maybe. How many kids are in danger of a tripping injury because they can’t find the way from the street to your house on Halloween? Could you be sued? GET THOSE CHRISTMAS LIGHTS UP NOW. Besides, better for kids to see an early Christmas tree than a pumpkin carved like a wormy skull with a spider crawling out. The decorations are better, so let’s just go with Christmas and skip the rest. Easter has pastel colors. Yuck. Halloween is black and orange, great if you work for UHaul. The best Thanksgiving table will have a centerpiece of plastic pilgrims standing around vegetables you can’t eat. But Christmas? Christmas is deep red, green, gold, nativity scenes, camels, and reindeer. How does a plastic pilgrim compete? Thanksgiving has turkey. The reason we don’t eat it the rest of the year is that it isn’t that good. Christmas has eggnog, cookies, and Chex party mix. It’s no competition, really. Because putting lights on your snow-covered roof on November 30 is foolish. And the only thing worse is NOT having lights on your roof for Christmas. That’s just wrong. If you are shopping early, Bizarre Christmas Bible Stories comes out in November. The book was also completed in June, 2014. Her question was the motivating factor for the book, and the focus of the first story. All profit (billions, I’m sure) from Bizarre Bible Stories 2! Go to the Children’s Cancer Recovery Foundation – Helping Hands Fund. this fund. The fund was her dad’s suggestion, as it had helped them over the years. Why Cancer? I don’t know. I do know the attack on children and their parents seems to be especially brutal. I know it is the result of sin, and as such we need to fight it. I hope you can help.